One of my best kept secrets about running (not that I claim to know anything about it) is listening to audiobooks while I run. A friend of mine actually suggested it when I was training for the San Francisco Marathon and the longer runs started to get a little boring. I've tried music (like everyone else) and going "all natural" (as my buddy Skip Fuller likes to say) without headphones but I love the audiobook. It keeps my mind working, keeps the focus off the running during the hard times. Some of the training though should be a mind battle, should be "all natural", should be about getting through the hard times. Running or training as you will is a projection of life. Some times it feels great and you just want to keep going, other times it hurts and nothing could be harder than putting one foot in front of the other. My buddy Skip is smart going "all natural", getting through those rough patches in the training will only serve him in a race and life. Training, the diabetes and life all have one thing in common. Sometimes you just need to keep moving forward. And you know what? The runs where I want to quit and end up finishing are the ones I gain the most from, the ones that give the most satisfaction. As Sun Tzu says in The Art of War, "Battles are won before they are ever fought". Going into a workout with a good mindset can overcome any difficulity. This, as in running, is the same with the betes I've come to find. Having the correct mindset about insulin delivery and carb intake equates to good blood sugars. It's those meals when I don't take a moment to think about the carbs and insulin, trying to just let everything fall into place that the the glucose rises and everyone goes crazy. Every once in awhile you have to take a step back and think "wow". Take a long look at life, at the possibilities to come, the things that have gone, wondering what will come, whats next in this great journey we all call life. I still recall the first day of baseball my freshman year of high school, Coach McHorney saying "twenty years from now no one will care what you batted your senior year". At the time that didn't make sense but it does now (.411 if we are keeping score though coach). In the long run, the little things don't matter, today's problems are yesterday's forgotten memories. The hard times just a figment of the imagination. Times when I slip on the diet or skip the last two minutes of a workout seem really upsetting at the time but in the long run don't mean all the much. Or do they? In the marathon each step makes up the race, each mile leading to a water station, each water station hydrating you until the finish line. After awhile those two missed workout minutes add up, that bad meal sits in your gut for a long time and ruins the next workout. It all adds up, it all ties together. Do the work today, it pays off tomorrow. Luckily, this training plan has been going well. Hardly having to miss a workout, the ones I have had to switch around have been made up in one way or another. The gluten free diet is one of the best decisions I have ever made, making me feel a lot better diabetically (is that a word? it should be) and athletically. What am I really getting at here? What would really make me think of a speech my high school baseball gave? Graduation is closing in on me, with a Master's degree in Sport Management less than a month away. Big changes coming in life, ones that will shape my future, my future with Jamie, the future of my diabetes and my racing. Side note: ﻿Since the Aquathlon was cancelled on May 7, I just signed up for the Encinitas Sprint Triathlon. A nice cold 750 meter ocean swim followed by a 20km bike with a 5km run on Sunday, May 15. With the training going well for nearly two months now I am really looking forward to getting a good race in before going up to San Francisco for graduation. Get the competitive juices rolling. I didn't blog last week which bugs me the same as missing a workout. I'm a routine kind of person, hence why I like multisport so much. It gives me balance, gives me routine, a set of goals to look at and accomplish. However, over the last two weeks my life has been anything but simple routine. Travel for work put me up in San Francisco for three days, travel to a wedding with Jamie put me in Phoenix the three days following the Bay Area then after four days of work after traveling back from Phoenix and I was in San Luis Obispo for Jamie's Water Polo tournament... woooo, hope I got all that in. One of the things that worries me about travel is the betes. It's really hard sometimes on the road. It's easy at home. I make this, give this amount of insulin, bam done. On the road it's different, it's basically a guess and check at each restaurant. Before the trip I told myself, this time it would be different, this time I would really manage the betes on the road. What happened? For the first time in my life I made a lot of great inroads when traveling. Mainly, I ordered... off the menu. Simply asking the waiter for "Salmon with steamed veggies and brown rice" actually isn't hard once I started doing it. Doing this allowed me keep my blood sugars in check while traveling. A lot of this depends on the restaurant but for the most part each place will allow a person to order some kind of meat they have with steamed vegtables and rice, potatoes or a salad. At one point though Jamie and I stopped at a small place in the middle of the desert, let's just say it wasn't the kind of joint that wants people ordering off the menu, so it does still depend. I'm also still learning a lot about which foods are gluten free and which are not in a restaurant. I'm starting to get to the point where some gluten products give me a stomach ache, which is good and bad. It's good because it forces me to eat clean but having that blue cheese dressing on the Amtrak train then getting a stomach ache isn't so fun. Last time I have that blue cheese dressing. While traveling I was able to keep most of my workouts in check. I only missed one swim workout while in the Bay Area and the bike workout the day after the wedding but being a recovery week I couldn't have asked for it to work out better. I even supplemented a light Friday bike while in San Francisco with a yoga video followed by running stairs (this was the first time I had ever done yoga, which by the way made me incredibly sore the following day but definitely helped my IT band). Supplementing the typical workout actually turned out to be nice, it breaks up the routine and still let's me keep the sugars in check while on the road. The body also responds well to random changes, shocking it into becoming more fit. After all this travel for the first time I was able to go ride with a triathlon group. TriFit Multisport here in Santa Monica. Not only was I able to ride with this group, making riding safer and the long weekend ride much more fun but Eric Tozer, a Team Type 1 runner who I recently met at the gym was also able to join. Eric and I meeting is great in joining both InsulinDependence and Team Type 1 here in Southern California. After the ride Eric told me how shocked one individual was after he heard we were both diabetic, "that's amazing, I can't believe you guys are riding with us". Changing minds one person at a time. Although the blood sugar didn't always stay in check during my travels, I can say I learned a lot over the last two weeks. For one, just order what is easiest at a restaurant, in the end it only assists in the management of the diabetes. So what if the waiter would rather not deal with this, it's my blood sugars at risk. Secondly (and already I know this but can never be reminded enough), it's always good to talk about the diabetes with people that you may not know, you might just change a mind. Note: My Aquaterra Aquathlon for May 7th was cancelled, looks like they haven't had many sign ups. May change the race schedule to doing a half-marathon or 10k that weekend. The above video is from a Bay Area beach right outside my hotel room. 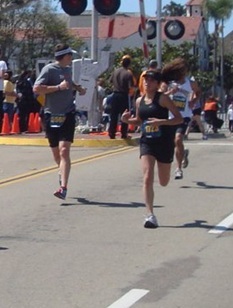 The first race of my season went off this weekend, racing for the second time in 2011 along the Pacific Ocean in Carlsbad, CA. The weather turned out to be wonderful after a little early "June Gloom" in the morning, almost getting a little too warm during the race under the sun. The race was hailed as a perfectly flat, "world's fastest course", as three of the five top world record times for a road race 5k are held on this course, in the end I would say that has more to do with the large prize purse than the "flat course" with a few up and downs along the ocean. The race itself was on Sunday but before that I spent a little time with other diabetics throughout the weekend. After battling Los Angeles and Orange County traffic on Friday night I finally made it down the 5 highway to Solana Beach to visit the new InsulinDependence (iD) headquarters. Most of the diabetics and friends attending were competing in the Oceanside 70.3 (half Ironman) the next day so hearing their race plans and how their training has been going along with their diabetic management was a delight. When you get over ten diabetics in a room someone is always taking their blood sugar which always motivates myself to check the blood sugar more. After eating far too much food at the BBQ, race day came around. This race was odd though, instead of having everyone go off in waves seperated by only a few minutes, each division had its own race. The twenty-nine (29) and under race went off later in the day at 11:30am (later in the day right, I'm like an old man), making dealing with blood sugars a little different. Being that I had already been awake for over five hours at the start of the race, the insulin in my system was much more active. 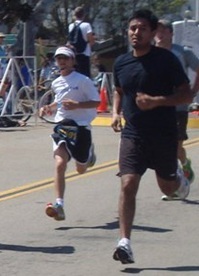 After a quick 15 minutes warm up run, I toed the start line with fellow diabetic Ryan Maloney. Ryan is only 12-years old and battles the betes just like I do, actually he is the same age as when I was diagonsed. Anyone can tell Ryan is really mature for his age, I would assume a lot of that is from the diabetes, if taking care of yourself medically doesn't instantly mature you, I don't think anything will. It's great to see a kid with Ryan's heart and even better to know that maybe some of the advice I give him can be used to his advantage, avoiding many of the growing pains with the disease. The race was off and it was quick, too quick. I was breathing heavy but never looked down at my watch for my heart rate or pace until the first mile marker which read.... 5:45. 5:45! That's the fastest mile I've ever run by far. I thought the clock was off until I looked at my watch and sure enough, it was right. My first mile split was a quick 5:45. That's when the stomach pain set in. Having this late race I decided to take another gel right before the start, mainly from paranoia of a low blood sugar during the race. I think even Ryan gave me an odd look as I down the gel. Mistake, taking a gel without water and overeating the night before at the BBQ. Either way, the stomach hurt. I slowed down the second mile (a 5k is 3.11 miles) to 6:30 and right around 1.5 miles slowed down even further, mentally giving in a little too much. My third mile was over 7:00. I didn't think my time would even be as good as it was and I started to look back to finish with Ryan. I couldn't see Ryan until after he finished but he did a great job with a 24:16. Considering he is only 12 that time is tremodous. I hope he ends up joining the cross country team because he definitely will only get faster. Okay so I didn't need that gel obviously but sometimes it's just about settling the mind even more than the body. Coming around the last corner I was shocked I remained running at that pace, I thought I had slowed down a lot more than that and although not under my goal time I am happy with it. The speed work over the first month of training this season has been very short interval runs. Doing runs like this are great additions for my overall training either way. Also, it shows me how fast I need to go to learn pacing, I have a tendacity (ok so I always do it) to go out too fast and burn out late. After the race I was also able to get in a good swim with Jamie who I had dragged to the Carlsbad 5k (she also took all the pictures, thanks Jamie). I'm still trying to convince her to sign up for the Aquathon in a month, knowing that she could crush everyone in the water.